Mary-Catherine French, administrative assistant in the Charles H. Dyson School of Applied Economics and Management, earned the Core Value Staff Award for Stewardship at the Research, Extension and Staff Award ceremony Oct. 30. She was nominated by her colleagues in the Tata-Cornell Institute for Agriculture and Nutrition (TCI) for the extraordinary dedication and critical support that she provides to TCI staff, faculty fellows and student scholars. TCI is a rapidly expanding research program focused on solving problems of poverty, malnutrition and rural development in India, established through a $25 million gift from Tata Trusts. A $14 million award from the Bill & Melinda Gates Foundation in 2017 will help the team implement a program known as TARINA, which offers technical assistance and research for nutrition and agriculture in India. As part of this project, TCI staff, and French in particular, have been working to establish an office headquarters in New Delhi, recruit highly qualified staff to implement the program in India and to build an international research program from the ground up. French has fostered the organizational expansion needed to meet TCI’s goals and objectives. Her role has required diplomacy, patience and agility to address dynamically shifting priorities, often across time zones. Through her years of service at Cornell, French is a font of knowledge when navigating the university’s financial and administrative protocols and is now mentoring and training staff as the TCI program grows. The Core Value Staff Awards recognize staff whose performance has gone far beyond the standards defined by Cornell’s Skills for Success, recognizing performance that surpasses expectations and makes a significant and unique contribution to the college. The award for stewardship is presented to someone who demonstrates accountability in all work responsibilities; strives to implement best practices; exercises sound ethical judgment no matter how difficult the situation; and considers environmental, economic and social impacts in decision-making. 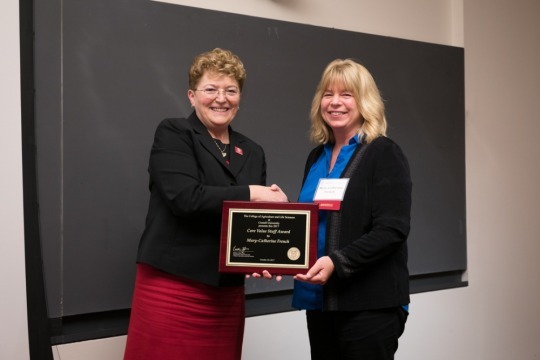 “Mary-Catherine exemplifies the values associated with institutional stewardship at Cornell, and I’m pleased to acknowledge her unparalleled contributions,” said Kathryn J. Boor ‘80, the Ronald P. Lynch Dean of the College of Agriculture and Life Sciences (CALS). This blog was originally featured on the website of College of Agriculture and Life Sciences.